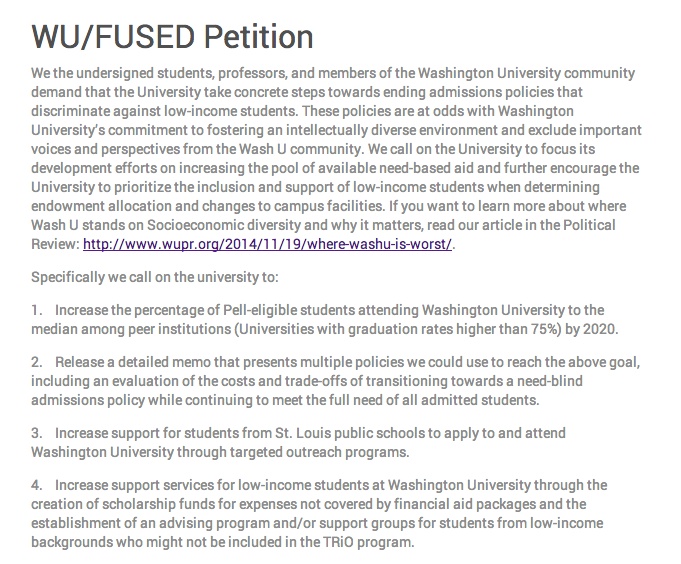 As a response to the low ranking, Washington University for Undergraduate Socioeconomic Diversity (WUFUSED) has launched a petition to call for an increase in the pool of need-based financial aid and for greater support for low-income students on campus. In addition to the petition, students made a Facebook page called “Wash U Voices on Socioeconomic Diversity” which features a clever photo campaign in which students hold up signs with statements beginning “I’d give up…..to make WashU financially accessible for low income students” and “WashU needs socioeconomic diversity because..” It is compelling to see how students fill in the blanks. Students are increasingly organizing around issues of access and inclusion for low-income students. These efforts are setting an important precedence for students across the country wanting a more socioeconomically inclusive campus.